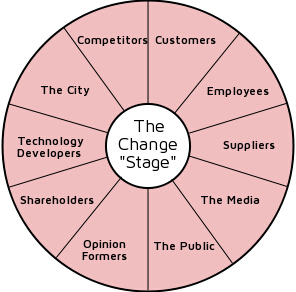 You are here: Home › The Change "Stage"
Change management is like theatre in the round - there's no backstage for last minute rehearsal and all that you do will be seen by some part of the audience. You need to understand what the view is like from all parts of the house and think yourself into the minds of all sections of your audience. We'll do the research that gets a handle on the views of all these audiences and the possibilities for change so as to help you manage by fact. Having done this research, the linking of goals to action through an engaging and excellent planning process, and realising the plan through effective motivation and change leadership are the keys to success.